Engineered by Nature. Enhanced by Technology. Welcome to the North American Wood Pole Council website. NAWPC is an independent council representing the producers of wood poles and crossarms in North America. The Council is supported by member companies from the Western Wood Preservers Institute, Southern Pressure Treaters' Association and Wood Preservation Canada. Energize your knowledge of new developments and recognized best practices for wood pole overhead systems at the Powerline 2019 Conference June 4-5. Registration is now open for the two-day conference, held on the Mississippi State University campus in Starkville, Miss. The conference is sponsored by NAWPC and the university. The conference fee is just $195 per person. Click here to for more infomrmation on the conference. For as long as there have been wood poles, there have been wood crossarms. 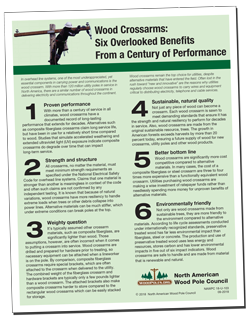 The often overlooked benefits of wood crossarms compared to alternative materials our outlined in a new publication Wood Crossarms: Six Overlooked Benefits from a Century of Performance. The one-page technical sheet reviews the extensive performance record of wood crossarms, which can be found throughout North America. Wood crossarms are a vital component that carry wires and other equipment to bring electricity to the continent. Common misperceptions, such as wood crossarms are heavier, are explored in the sheet. It also notes that alternative materials are often three to four times more expensive than wood for crossarms that are functionally equivalent. Click here to review the crossarm publication. Utilities can get an assist in expanding their community affairs activities and communicating important safety information on overhead lines with a new, customizable coloring book. 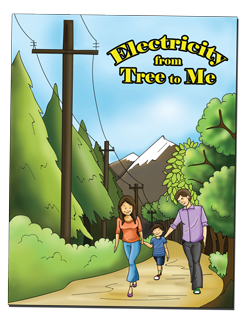 The 16-page book “Electricity from Tree to Me” is designed for children from kindergarten through elementary school. It explains how wood utility poles are made from sustainable and renewable trees and includes important safety messages for about overhead lines, including what to do if lines are on the ground. NAWPC has created a companion Teacher's Lesson Plan for teachers who want to use the coloring book in the classroom. The lesson plan provides learning objectives and suggestions for classroom discussions to engage students. The book is designed to be customized with utility information on the inside cover page and the back cover. The pages can feature colored artwork, such as a utility or company logo, so it can be integrated into utility community affairs programs. Click here for information on how to order customized coloring books for your utility. Custom color books are available for less than a dollar each for 1,000 or more copies. Quantities of 500 and 750 copies are also available at discounted prices. Click here to review the coloring book. Hiding power lines underground is significantly more expensive than using overhead systems, potentially costing utility customers millions of dollars. 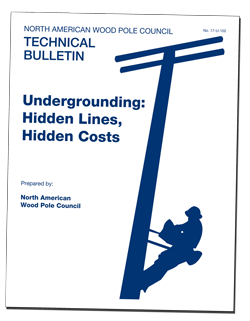 The high cost of going underground and other potential issues with burying lines are explored in a new Technical Bulletin Undergrounding: Hidden Lines, Hidden Costs. The new bulletin reviews government studies that show moving lines underground cost as much as 10 to 20 times more than overhead systems using utility poles. It also explores the supposed improved reliability of underground systems and the potential safety issues when such systems fail. Click here to review the Technical Bulletin. The misleading claims that steel, concrete and fiberglass poles can be substituted as "equivalent" to wood poles are explored in a new Technical Bulletin. 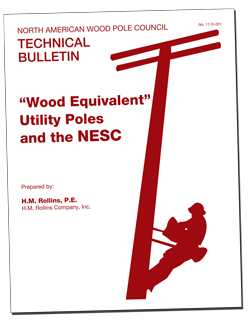 The bulletin, "Wood Equivalent" Utility Poles and the NESC, details wood's unique structural properties that are recognized in the NESC. The bulletin notes there is no universally universally applicable “wood equivalent” pole made from steel, prestressed concrete, fiber-reinforced polymer, or other nonwood material because of the differences in relative strengths inherent in poles manufactured of different materials by different methods. Understanding national wood pole standards and how they apply in designing overhead electrical systems are critical for utilities. 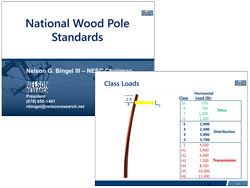 A new presentation National Wood Poles Standards helps create that understanding with an overview of the standards process and basic wood pole design information. The presentation was developed by Nelson Bingel, chairman of the National Electrical Safety Code (NESC). Click here to review the presentation slides.